Rahul Gurung from Sikkim emerged as the champion of the North Eastern States FIDE Rating Chess Championship for the second consecutive times. Gurung secured a total of eight and half points in the 19th edition of the championship held here at Sikkim Manipal Institute of Medical Sciences auditorium in 5th Mile Tadong to defend his champion title. Another player from Sikkim, Rakesh Gurung was placed in the second position and Soram Rahul Singh from Assam secured the third position in the championship. 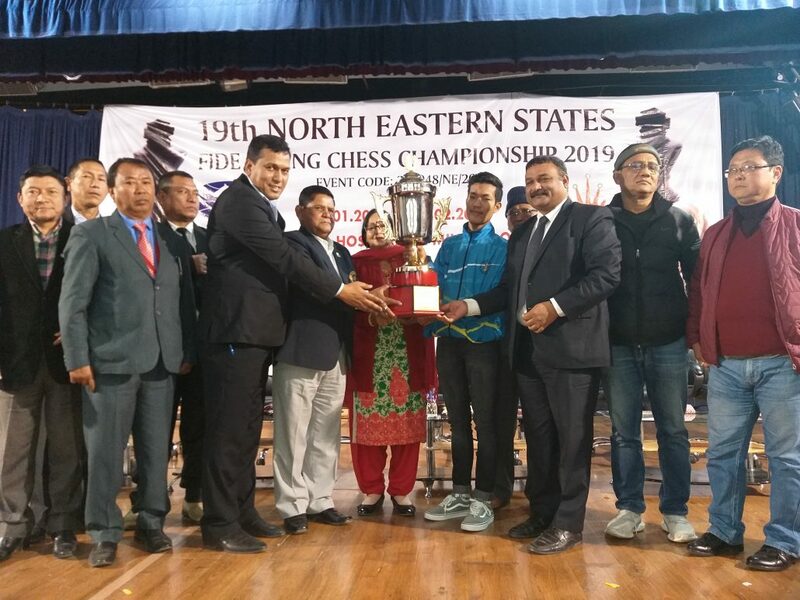 The six-day long prestigious championship was organised by Sikkim Chess Association [SCA] under the aegis of All India Chess Federation [AICF] for the second time in the State from January 29 to February 3. A total of 250 players from northeastern states participated in the tournament. Trailokya Nanda from Assam secured 7th position, Nitish Das from Assam was p;aced 8th, Iftikar Alom Mazumdar from Assam placed 9th, Dupit Tabu Arunachal Pradesh secured 10th position, Silkam Sangma from Meghalaya – 11th, Projit Phukon from Assam – 12th, Lalnungsanga from Mizoram – 13th, Manoj Das from Assam – 14th, Thendup Tamang from Sikkim – 15th, Hage Lasa Nado from Arunachal Pradesh – 16th, Rajbeer Ahmed from Tripura – 17th, Barbith M Sangma from Meghalaya – 18th, Rijied Katrai from Meghalaya – 19th and Raluk Dui from Arunachal Pradesh secured 20th position. Rahul Gurung received the winning trophy along with a cash prize of Rs 30,000 while the organisers handed over medals, certificates and cash prizes to other players who were in the list of top 20 and top three players in different age categories. The tournament carried a total cash prize of Rs 1.5 lakh, which was sponsored by the All India Chess Federation. The prize distribution ceremony had Sikkim Olympic Association president BK Roka as the chief guest, who along with other special guests gave away trophy and medals to its winners. Sikkim Chess Association also honoured the youngest player in the championship, 5-year-old John Lalrinfela from Mizoram and oldest player, 84-year-old TP Ghimirey from Sikkim. In his address, the chief guest congratulated all winners and participants from different NE States in the championship. He also congratulated all parents for supporting and guiding their children and stated that such support and encouragement from parents would take their children in the national and international level. Roka encouraged SCA to continue with its efforts for the promotion and development of chess in the State and in providing more platforms to players. Chief Arbiter of the championship, Dharmendra Kumar stated that the standard of the chess in Sikkim and entire northeastern region has been gradually improving and lots of quality players have been coming out of the region. He also congratulated Sikkim for making a prominent place in chess in the northeastern region in a short period. He encouraged SCA to continue with its efforts in producing more quality players from the State. SCA general secretary Mahendra Dhakal expressed his happiness and satisfaction on the performance given by players of Sikkim in the championship. He stated that the achievements made by Sikkim players would encourage other players and would help the efforts of SCA to produce International Masters and Grand Masters from Sikkim.